The prayers said during the Rosary are; the Apostle's Creed, Our Father, Hail Mary, Glory Be, Fatima Prayer, Hail Holy Queen, and Memorare. I believe in God, the Father the Almighty, Creator of heaven and earth; and in Jesus Chrsit, His only Son, Our Lord; Who was concieved by the Holy Spirit, born of the Virgin Mary, suffered under Pontius Pilate, was crucified, died, and was buried. He descended into hell; the third day He rose again from the dead; He ascended into heaven, sitteth at the right hand of God, the Father Almighty, from thence He shall come to judge the living and the dead. O my Jesus, forgive us our sins! Save us from the fires of hell. Lead all souls to heaven, especially those in most need of Thy mercy. Amen. Hail Holy Queen, Mother of mercy, our life, our sweetness, and our hope! To thee do we cry, poor banished children of Eve! To thee do we send up our sighs, mourning, and weeping in this valley of tears! Turn then, most gracious advocate, your eyes of mercy toward us; and after this, our exile, show unto us the blessed fruit of thy womb, Jesus! O clemet, O loving, O sweet Virgin Mary! 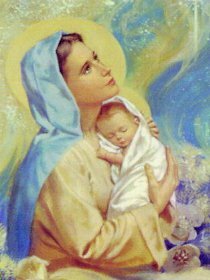 Pray for us, O holy Mother of God! That we may be made worthy the promises of Chirst. O God, Whose only-begotten Son, by His Life, Death, and Resurrection, has purchased for us the rewards of eternal life: grant, we beseech Thee, that, meditating upon these mysteries of the Most Holy Rosary of the Blessed Virgin Mary, we may imitate what they contain and obtain what they promise, through the same Christ our Lord. Amen. Remember, O most gracious Virgin Mary, that never was it known to anyone that fled to thy protection, implore thy help, or sought thy intercession was left unaided. Inspired by this confidence, I fly to thee, O Virgin of virgins, my mother. To thee do I come, before thee I stand, sinful and sorrowful. O Mother of the Word Incarnate, despise not my petitions, but in thy mercy, hear and answer them. Amen.